Amazon's problems with dishonest marketplace sellers passing off knock-offs as the real thing has just gone from bad to worse. The sandal-maker Birkenstock has taken the counterfeit problem to heart, and it has decided to pull its merchandise from Amazon and forbid any retailer from selling in Amazon's marketplace. Plagued by counterfeits and unauthorized selling on the online shopping site, the sandals company will no longer supply products to Amazon in the U.S. starting Jan. 1. Additionally, Birkenstock won't authorize third-party merchants to sell on the site, according to a letter the company sent to several thousand retail partners on July 5. "The Amazon marketplace, which operates as an 'open market,' creates an environment where we experience unacceptable business practices which we believe jeopardize our brand," Kahan wrote from the company's U.S. headquarters in Novato, California. "Policing this activity internally and in partnership with Amazon.com has proven impossible." It's unclear whether Amazon has a unique problem with fraudulent sellers or if they're simply the whipping boy du jour, although there does seem to have been an increase in complaints ever since Amazon started working more closely with Chinese companies. Those remind me of bad experiences which put me off of shopping on Ebay, only now it's happening with Amazon. And the thing about that mug is that it was sold by a marketplace seller which is still doing business on Amazon.com. I checked its products and many had a lot of 1-star reviews which complained about the quality. The goods might not be counterfeit, but they are cheap knock-offs and customers aren't happy. 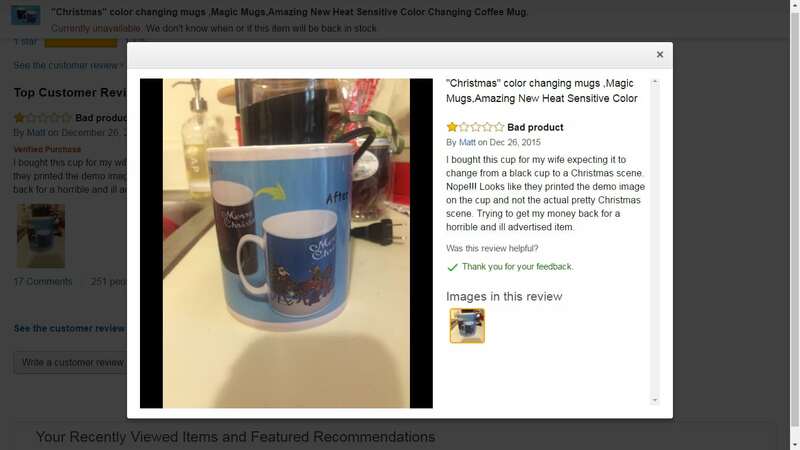 So while the mug's seller might not be committing fraud, it still stands as an example of how Amazon is embracing crap in its pursuit of profits. So yes, this is a sign of the problem going from bad to worse. This is interesting. Y’know, being in Malaysia, I buy stuff from Chinese traders All The Time. In a decade of online shopping with Asian shops, I think I only got stiffed twice. The most recent was for some ethernet cables that worked but had cheap and wonky connections, but I bought them from a local merchant! A closer analysis of the actual knock-off merchants might be in order. I don’t mean to say they’re all good–I wouldn’t touch any food that comes from China, for example, although I don’t think I have a choice when I go to a restaurant–but this craziness probably originates from con-artists who see Amazon as a free-for-all zone. On sites (yes, even Asian ones) which adhere to policies on fraudulent products, you don’t see this. The Birkenstocks hit me hard. I did buy one pair at Amazon, but I had to research thoroughly before I’d buy. If it was less than $90 and Prime shipping, no go. I’ve been looking ever since, but haven’t dared buy. I just wanted some variety and there are styles that are super hard to come by, even in the Birk store. Amazon had them, but I don’t trust easily.